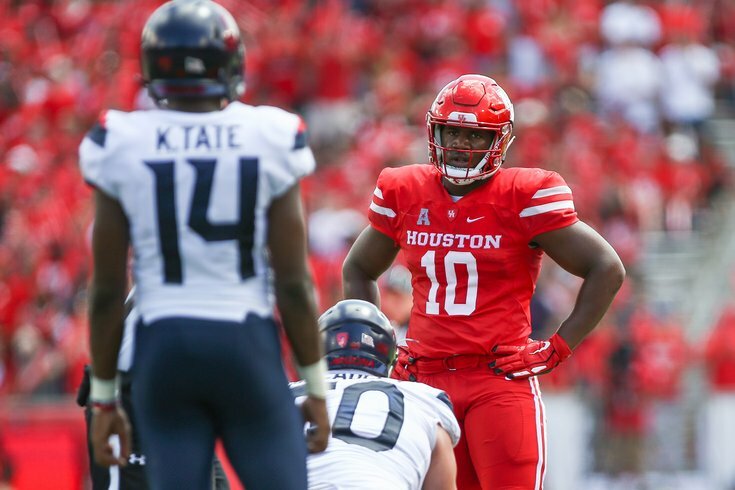 Houston Cougars defensive tackle Ed Oliver (10) looks at Arizona Wildcats quarterback Khalil Tate (14). Over the next month or so, we'll be tracking the Eagles' 30 allotted pre-draft private visits to the NovaCare Complex, as they are pretty good indicators of who the Eagles might draft. As visits trickle in, we'll add analysis of each player. Bookmark, please. Here are the players who have either visited, or reportedly will visit the Eagles. We'll update this every Saturday. Yes? Good? Good. To note, Brandon Gowton of BleedingGreenNation.com does a good job keeping his eye out for these reported visits. He'll almost always have these first. You can see their draft page here. I'm literally just jacking these visits from BGN, and adding my own analysis. Harry possesses a lot of the same traits as Eagles receiver Alshon Jeffery, so the Eagles' potential interest in him is interesting. It's perhaps worth noting that Jeffery will count for a hair under $16 million on the Eagles' cap both in 2020 and 2021. If they moved on from him after the 2019 season, it would be a savings of $10,025,000. If they moved on after 2021, they'd save $13,000,000. We're not suggesting that Jeffery's roster spot is in question, but if they were to draft a guy like Harry, let the speculation begin. The lack of production can also almost be looked at as a good thing, in that he'll be a 21-year old prospect with very low mileage. He wasn't just a workout warrior though. He was a productive player in college who managed 10.5 sacks in 2017, despite being shut out in the sack column first four games. In 2018, he had 12 sacks. Sweat originally enrolled at Michigan State, left to play at a junior college, and then landed at Mississippi State. Sweat won't be available at pick No. 25. If the Eagles were to land him, they would have to trade way up. Baker was a standout corner for the Bulldogs, who is being projected as a first round pick. Here's a highlight reel. I love the first play that they show. According to cfbfilmroom.com, Baker allowed just 9 completions and 1 TD on 34 targets in 2017. He had 3 interceptions. He 2018, he allowed 10 completions and no TDs on 27 targets, and 2 interceptions. Baker is also a very good tackler. In 2017, he had 44 tackles, and only had 4 missed tackles, a good ratio for a corner. In 2018, he had 40 tackles and no missed tackles, again, according to cfbfilmroom.com. Baker is a competitive player that Jim Schwartz will surely like. However, he's on the smaller side, and he ran a below average 4.52 at the Combine. Thornhill was a fourth-round pick in our Eagles-only mock draft, version 2.0. Within that piece, we noted that he was more likley going to end up being taken in the third round, not the fourth, but because I liked him so much as a prospect, I wanted to shoehorn him in, ha. After testing extremely well at the Combine, it's doubtful he's going to make it out of Round 2, and could be in play there for the Eagles. For example, undersized DT Sheldon Rankins went No. 12 overall in 2016, and he hasn’t disappointed. Personally, I don’t think Oliver will slip into the late teens, but if he does, I think the Eagles should strongly consider trading up to get him, and it's smart that they're doing their due diligence should that opportunity present itself. At 6'2, 208, with a 4.4 40, Johnson is a height-weight-speed freak. However, he's raw. Johnson was a receiver his first two seasons at Houston, but flipped over to corner for his last two. As such, he is thought of as an inconsistent player, but one with a high ceiling. For the Eagles' purposes, Johnson makes sense as a developmental prospect. They already have 6 corners in Jalen Mills, Ronald Darby, Sidney Jones, Rasul Douglas, Avonte Maddox, and Cre'Von LeBlanc, but Mills and Darby are both in contract years. Johnson is thought of as a very good player on special teams, so he could contribute there until he's ready to play in the regular defense. The downsize is that he's a smaller safety, which will turn a number of teams off, but doesn't seem to bother Jim Schwartz. Savage's skill set reminds me a little of Avonte Maddox. He could fill a role similar to that of Malcolm Jenkins, who is heading into his 11th season in the NFL, as something of a field general capable of playing safety and slot corner. Ford can be a great guard in the NFL. He moves defenders off the line of scrimmage against their will, and he has enough athleticism to have played on the edge in Oklahoma's spread offense. But would the Eagles draft a guard in the first round when their offensive line is seemingly in good shape? I think there's an argument for it, if the team believes the player is really good. To begin, Brandon Brooks will spend the entirety of his offseason recovering from surgery to repair a torn Achilles. His return for the 2019 season is in question. But also, the contract extension signed by Isaac Seumalo was a very team-friendly one. His pay wouldn't be an absurd amount for a guy who can come off the bench and be the primary reserve at all three interior OL spots, and even on the edge in some extreme cases. Ford (or another plug-and-play starting guard) could bolster the Eagles' already sturdy offensive line by turning Seumalo's role from an average starter into a great reserve. But again, to take a guard in the first round, he better be really worth it. The Eagles of course already have a slot receiver in Nelson Agholor, though there were reports that they were shopping him. They likely still are. Even if Agholor remains on the team in 2019, the notion that the Eagles shopped him doesn't bode well for his long term future in Philly. Brown reminds me a lot of a bigger Golden Tate, for his competitiveness and unwillingness to go down once he has the ball in his hands. If the Eagles liked Tate, they'll love Brown. Brown is a player who should probably go somewhere in between the Eagles first-round pick at 25th overall, but before they pick again in the second-round at pick 53. I would view him as a trade-up possibility in round 2. While Lindstrom could display a little more nasty in his game and he's not going to win with pure strength, he makes up for it with excellent technique, balance, and quickness. His home in the NFL could be at center. His fit with the Eagles could be as a reserve guard-center, who could be the heir apparent to Jason Kelce, whenever Kelce decides to retire. Oruwariye had a solid Combine, and could possibly sneak into the third round of the draft. If he lasts until Round 4, that would be good value. Froholdt comes from Denmark, and has limited experience playing football overall, but the experience he does have was in the SEC against some very good defensive linemen. Upon arrival at Arkansas, he was a defensive tackle, who eventually flipped to the offensive side of the ball, where he played guard and center. Obviously, the Eagles took a chance on another foreign player with limited experience, but some athletic upside in Jordan Mailata. Froholdt could make sense as a late round pick or priority undrafted free agent. His stats also won't get you excited, as he had 14.5 sacks over the last three seasons, with a season high of 6. However, he is thought of as a very good run defender, and a tough player. Here's a breakdown of Collier by the Cowboys' website. Personally, if I'm shopping for defense end talent, I want my starters to be explosive impact players. I don't think Collier is that, but he can be a good rotational player. Above, the Cowboys' website guys see him as a third-round pick. That's about right. He'd be better value in the fourth, obviously. Still, you can see his athleticism as an up-field rusher. On the downside, he is thought to need significant work against the run. As far as his fit with the Eagles, Ximines would be a sub-package rusher until he could prove he can hold up against the run. Many see him as a Day 2 pick. I see him more as a developmental prospect with some nice upside, but also a low floor. If he's there on Day 3, sure. Any sooner, I'd pass. There's nothing particularly dynamic about Higdon, which makes him a lot like the backs the Eagles already have. Gardner-Johnson is a solid Day 2 prospect. It should probably be noted that the Eagles' interest in Howard appeared to occur before they re-did Jason Peters' contract. With Peters coming back to the team in 2019, the Eagles have an abundance of offensive tackles already on the roster, in Peters, Lane Johnson, Halapoulivaati Vaitai, Jordan Mailata, and OG/OT Matt Pryor. Howard is a developmental OT prospect, like Mailata, but with Peters returning, I don't see where he fits on the roster.